I inherited this clock after my Grandmothers death in 1984. She came to the United States from France as a war bride after World War I. The clock was restored to working order in 1985 and has kept perfect time ever since. (unless I forget its weekly winding). The story that Grandmother told us about the clock was that her Grandfather purchased it at an estate sale of the Duke of Conde'. 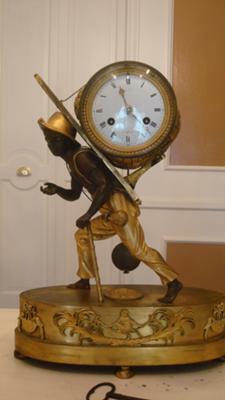 The clock is a style known as Blackamoor. 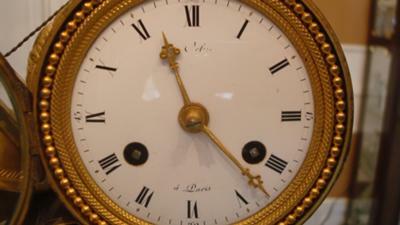 I have only found one other specimen of this exact clock and that was an individual in the Netherlands. 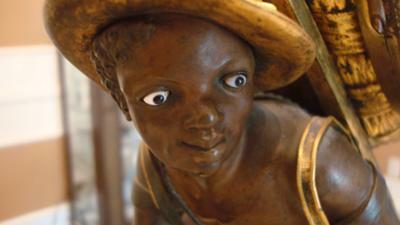 The clock is about 35cm tall made of bronze with guilding and ceramic eyes. The detail of the figure and clothing are fantastic down to the fingernails and toenails. We believe it to be from the French Empire Period ca. 1810.